In 1998 GIZ (former GTZ) published the “Guiding Principles on Land Tenure in Development Cooperation” in the form of a handbook. The publication enjoyed a warm reception and quickly became a source book among land experts and practitioners in Germany and abroad. Since then the relevance, sensibility and complexity of land policy and land tenure issues have even increased, among other reasons, due to a new wave of strengthened interest in land and agriculture as an investment opportunity, a situation often referred to as “land grabbing”. Indeed, many experiences have been gathered, knowledge built up, new challenges arisen and new institutions and activities have been developed, also in German Development Cooperation. In fact, securing access to land for the rural population in our partner countries has become one of the six pillars of BMZ Special Initiative “One World; No Hunger”. This entails a new focus and more resources committed to this crucial thematic area and, therefore, also a need for appropriate orientation, knowledge and guiding principles for practitioners. 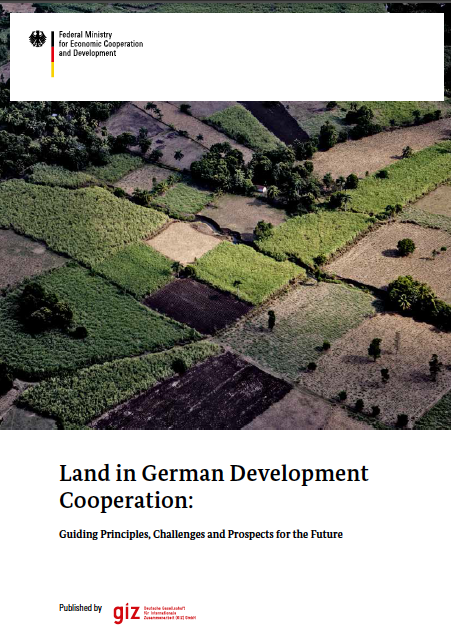 This is the purpose of the present publication, titled “Land in German Development Cooperation: Guiding Principles, Challenges and Prospects for the Future”.